Welcome to United Parts Service, or, "Unipaser". We hope you will find something of interest here. With over 30 years of exposure and involvement with Unimogs, we’re sure you’ll find something new. Our motto, "dedicated to the Unimog S404 – always have been, always will be", remains eternal. Our Catalog Nr. 4 provides what we have for this model. Therein you will find not only what is currently available, but also reference material for those seeking historical reference or the one-off odd part thought to be non-existent. Notwithstanding the Unimog S404, there are some things to be found for other models as well. Have a look at the SPECIALS section and you’ll see what we mean. Perhaps you’ll find just the part you’re looking for. We continually get requests for other Unimog models and have been providing parts to municipalities, transit organizations, governmental agencies and businesses for decades. 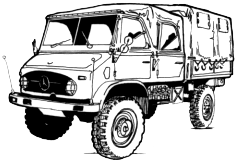 We’re glad to help, however, since the beginning of production in 1950 under the Mercedes name, no less than 35 distinct families of the Unimog have emerged; from the 2010 to the U500. It is for this reason that in order to be able to correctly identify the parts you need, we need to have your complete, correct chassis, or VIN number at hand. Even then, as these vehicles have been in circulation for decades, in some instances, component assemblies, superceded parts (and their respective numbering), and non-standard items replacing OEM parts may have been changed, thus presenting more of a challenge in parts identification. As well, we may be able to positively identify your specific model with the factory data card thus simplifying the process of parts identification. Feel free to contact us with your Unimog needs or questions. If you must leave a message, please do so. We'll normally return your call within the hour. We appreciate your visiting our site, and look forward to hearing from you.